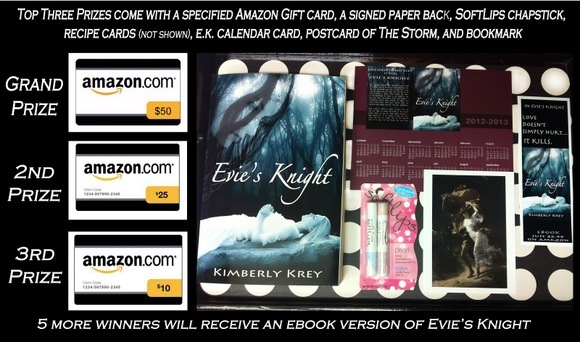 The following post is by guest author Kimberly Krey who shares with you an excerpt from her new novel, Evie's Knight. Evie’s Knight fits into multiple genres: From Urban Fantasy and Paranormal, to Clean romance or Young Adult. Yet above all the sub-genres, Evie’s Knight is, first and foremost, a Romance. We all know that love goes deeper than simple attraction. Sometimes that undefined moment of love budding between two people is a presence all its own. A penetrating force that slips into the space between them. This post is dedicated to that initial connection between Calvin and Evie – the very first sparks of L. O. V. E. These are moments when Evie can literally feel herself connecting to Calvin on a deeper, more meaningful level. Welcome to Part Three of ‘All You Need Is Love’. Here, Calvin, upon analyzing Evie’s art as assigned in their college class, has asked if she would be willing to share her inspiration for the piece. The tender urging in his eyes encouraged her, gave her confidence to continue. He wanted to know more. Evie nodded, melting in the magnetic connection. “We do.” The words came out quieter than she meant them to. Oh wow! I simply love that cover! :D And thanks for the amazing giveaway! Looks like a great book! Thanks for the awesome giveaway too! Oh my gosh! I love the idea for this book! I would love to get a hold of Evie's Knight! Sounds like an intriguing combo of contemporary YA and paranormal! Followed from the Blog Hop! This book sounds so absorbing. I can’t wait to get sucked into it! Book sounds great, hope I win! You had me with the cover. I'm hooked and I want to read more!!! Thank you so much for the awesome giveaway. More books is the best thing ever! Gotta love this awesome prize!! Thanks so much! awww thanks for the awesome prize!! i'd love to have the book, sounds very interesting! good luck everyone! Fab excerpt. Thank you for the giveaway! Book sounds awesome! Thanks for the giveaway!! Sounds like an awesome book, I haven't had the chance to read anything good since I've had kids, would love to read this. I'm typically not attracted to romance type books but this one looks intriguing. Thank you for the opportunity! looks like a great read, thank you! Hi I just found your blog site so I'm looking around! Yes I'm a reader also. Intriguing excerpt, makes one want to read more. Enjoyed the excerpt - looks like I'll be adding this one to my TBR mountain! Thanks for the great giveaway. Sounds like a great book. Sounds like an awesome story. Adding to my TBR pile. Thanks for holding the giveaway. This sounds like an intriguing story...star-crossed lovers are always a draw, and adding a vengeful ghost or a family curse makes it a winner. Thanks for the giveaway, too. Sounds like a fun read--that 18th birthday line kinda drew me in there! This sound like a good book. Thanks for the giveaway!